Looking for tips and training as a Stampin’ UP! demonstrator to grow your business? No matter where you live in the world – the training center has classes you can access. CLASSES NEVER Expire and new information is always added to them. TALK ABOUT VALUE!!!! You will NOT find affordable training like this ANYWHERE!!!! The RemARKably Created Training Center Gives me a chance to use my 21 years experience and ongoing experience in my active personal business – selling, training, recruiting , team building and adapting to the ever changing face of direct sales & social media to help fellow Stampin’ UP! demonstrators have a RemARKable Stampin’ UP! experience. 2. Via my FACEBOOK PAGE with daily inspiration, occasional coffee chats, timely reminders, and business tips. HOW are the Classes Taught? The RemARKable Created Training Center Classes are unique in the “training” world – they are not a one hour webinar , a download, ebook, a simple recording you only listen to, a limited for “this” time only class or any thing else you may be used to from virtual online training. The Class is housed in a it’s own unique closed facebook group – each class in it’s own group to focus specifically on the topic of the class. *allows you to network with other class attendees through sharing, commenting and questions. The Class is taught featuring videos, homework, graphics, handouts, and access to me long after the materials are posted. *membership in our main RCTC facebook group – home to a free class on reading your reports, blog hops, tutorial coops, group pinterest board, swaps and general sharing by others taking what they do as demonstrators beyond simply enjoying the discount. *RemARKable team members enjoy all training for free as part of my upline support. 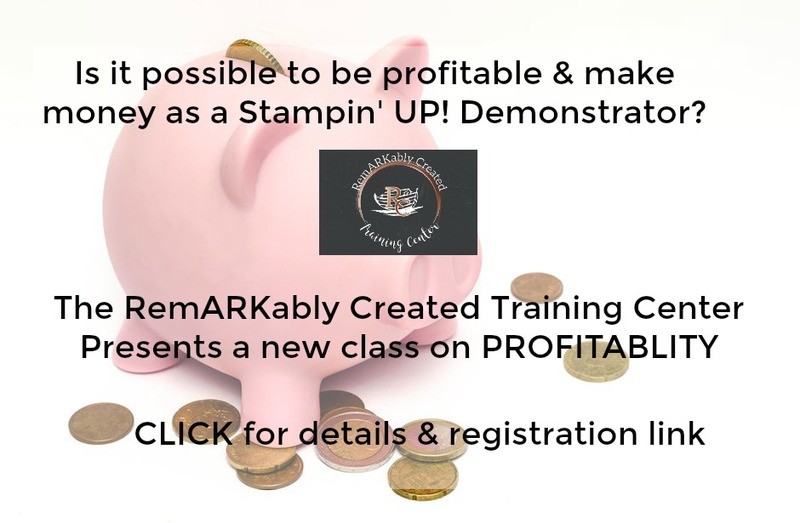 RemARkably Created Training Center Facebook Group – CLASSES NEVER EXPIRE and are continually updated with new tips and changes to platforms. 1. Making money as a Stampin’UP! demonstator? 2. 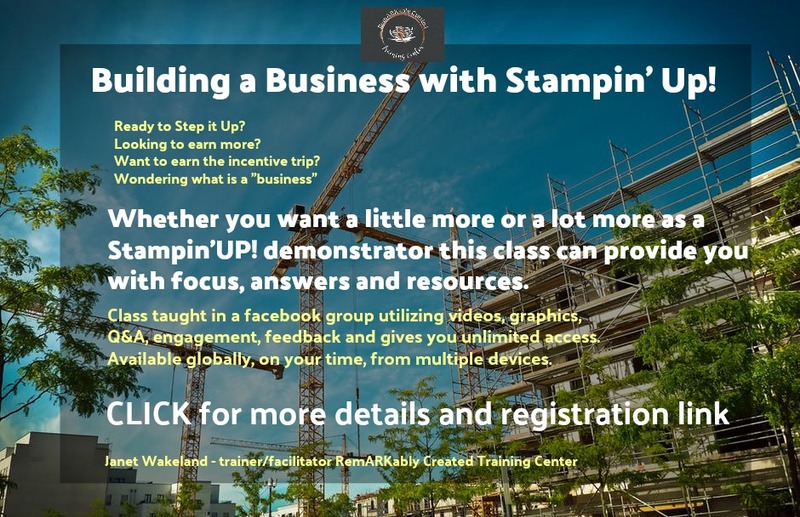 Buidling a Business with STampin’ UP! & Earning the Incentive trip as a result!! 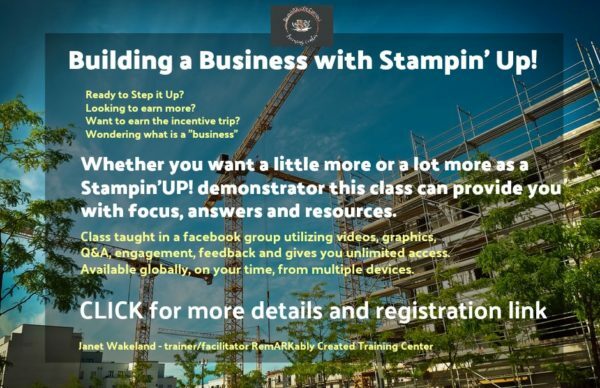 This class focuses on building a business so that you can enjoy the full offerings of Stampin’ UP!’s compensation plan. In addition to business support and a monthly video on where to apply your energies each month the class also includes great support for earning the incentive trip such as scenarios for incentive trip earning along with a break down of the points to earn the incentive trip but is a class designed to help you build a business. No matter when you join this year all past class materials are available to you. In additional to initial training, monthly tips will be added, timely tips related to newly announced SU programs, catalogs, promotions, great ideas shared and gather, fun new graphics and more will be also be added through out the year. Your greatest financial success in direct sales is through team building. Team building will also help you realize ongoing perks like performance bonuses, flex points, promotions. With a strong personal record in sharing the opportunity and a passion for it, this class helps you take your recruiting activity to the next level. 4. YOU TUBE for Demonstrators – video is powerful – video can change your business. Are you using it? Why not? Come learn about equipment, you tube basics, ideas for videos, basic editing and so much more. 5. FACEBOOK is an amazing platform for Stampin” UP! Demonstrators both for our customers and our teams. It has made a huge impact on my business growth. This class primarily focuses on Business pages. With all the facebook changes Is facebook still vialable and a good place for businesses to put their time & energy? 1. Facebook groups – new features, using to train our team, customer groups. so many new features – group insights, custom color, announcements, membership question requests, group linking, admin badges, new member badges, using group as you page, units and the list goes on. Are you getting the most from facebook groups as a member of one, as a moderator of one? 2. Facebook LIVE videos – how to , why to, tips, equipment, types, content, etc. 4. Facebook Messenger – what’s up with ads in my messenger feed. More classes Coming – Time Management for Demonstrators, Organization for Demonstrators, Taking your business online, Kitastics (kits, kits,kits), Newsletter/Mailing Lists, Demonstrator Basics…..
Join my mailing list and check the DEMONSTRATOR box so that I can add you to the training center newsletter. Those taking the Businesss Building Class enjoy a discount on all future classes released after subscribing to that class.